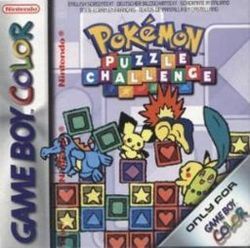 Pokémon Puzzle Challenge is a video game for the Game Boy Color. It was based on the game Panel de Pon, with characters from the Pokémon franchise. The characters in the game are based on those in the Gold and Silver games. The game is also focused around beating the Johto leaders in a puzzle challenge in Johto region. The gameplay mode is divided into One Player, Two Players and Training. This page was last edited on 11 May 2016, at 16:09.